Here's a solution for Bootstrap 3 and 4. This works in all modern browsers, including IE9+. If you need support for old IE as well, please use the legacy approach shown below. This techniques relies on the HTML5 hidden attribute. Bootstrap 4 uses the following CSS to shim this feature in unsupportive browsers. You may need to add if you're using Bootstrap 3. Im surprised there was no mention of the <label> element. The solution above requires jQuery. It's included in Jasny's fork of bootstrap. Upload buttons are a pain to style because it styles the input and not the button. Take a normal <input type="file"> and put it in an element with position: relative. To this same parent element, add a normal <input> and an image, which have the correct styles. Position these elements absolutely, so that they occupy the same place as the <input type="file">. Set the z-index of the <input type="file"> to 2 so that it lies on top of the styled input/image. Simplified answer using parts from other answers, primarily user2309766 and dotcomsuperstar. Uses Bootstrap button addon for button and field. Only one input; multiple inputs would be picked up by a form. No extra css except "display: none;" to hide the file input. Visible button fires click event for hidden file input. split to remove file path uses regex and delimiters '\' and '/'. With some inspiration from other posts above, here is a full solution that combines what looks like a form-control field with an input-group-addon for a clean file input widget that includes a link to the current file. I have Created a Custom upload button to accept only images, which can be modified as per your requirement. but using this, you should replace twitter bootstrap with jasny bootstrap files.. I tweaked two previous answers to include multiple uploads. In this way the label shows the file name, if only one is selected, or x files in the opposite case. <input id="my-file-selector" type="file" multiple="multiple" style="display:none"
It may also apply to change the button text and class. <input id="multfile" type="file" multiple="multiple" style="display:none"
I have the same problem, and i try it like this. I thought I'd add my threepence worth, just to say how the default .custom-file-label and custom-file-input BS4 file input and how that can be used. The latter class is on the input group and is not visible. While the former is the visible label and has a :after pseudoelement that looks like a button. You cannot add classes to psuedoelements, but you can style them in CSS (or SASS). Based on the absolutely brilliant @claviska solution, to whom all the credit is owed. 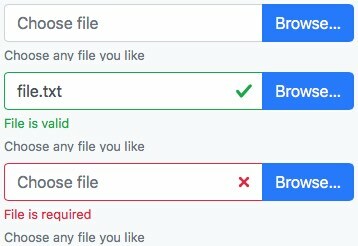 Full featured Bootstrap 4 file input with validation and help text. Based on the input group example we have a dummy input text field used for displaying the filename to the user, which gets populated from the onchange event on the actual input file field hidden behind the label button. Aside from including the bootstrap 4 validation support we've also made it possible to click anywhere on the input to open the file dialog. The three possible states are un-validated, valid and invalid with the dummy html input tag attribute required set. We introduce only 2 custom classes input-file-dummy and input-file-btn to properly style and wire the desired behaviour. Everything else is standard Bootstrap 4 markup. The dummy input needs to be read only, as per the original example, to prevent the user from changing the input which may only be changed via the open file dialog. Unfortunately validation does not occur on readonly fields so we toggle the editability of the input on focus and blur ( jquery events onfocusin and onfocusout) and ensure that it becomes validatable again once a file is selected. Aside from also making the text field clickable, by triggering the button's click event, the rest of the functionality of populating the dummy field was envisioned by @claviska. Most importantly we don't want the readonly field to jump between grey background and white so we ensure it stays white. The span button doesn't have a pointer cursor but we need to add one for the input anyway. Not the answer you're looking for? Browse other questions tagged css forms twitter-bootstrap input-type-file or ask your own question. How to customize <input type=“file”>?